When it comes to connecting parts of your air system or circuit together, along with the appropriate fittings, you have the choice of using Air Hose or compressed air tubing. 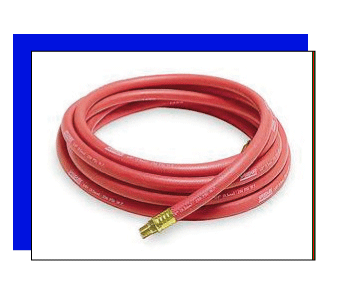 This page focuses on air hose. You can find information on air tube on this site as well, linked from the Sitemap page. Of course, compressed air hose and tube isn’t much good without the fittings to connect them. If you are looking for information on fittings, lots of information about air fittings can be found linked from the Sitemap page as well. This page focuses on air hose which is just one type of air line that brings compressed air to the air tool, air valve, air cylinder or other compressed air using application. When you are trying to figure out what hose size you need, or even why a 3/4″ hose is well over an inch in diameter, just remember the acronym H.I.D. The ‘H’ in H.I.D. stands for HOSE. The ‘I.D.” in HID stands for the hose “inner diameter”. Hose size is measured by its inner diameter. A 3/8″ hose will have a hole in the center that is exactly 3/8″ in diameter regardless of how the outer diameter of the hose varies. And it does, depending on the type of hose and the manufacturer. So, will all same size air hoses have the same outer diameter (O.D.)? Nope, they won’t. Different manufacturers offer air hose with varying wall thickness. Therefore, one 3/8″ hose might be just under 1″ in outer diameter, another might be a 1 1/4″ outer diameter, yet in both cases the I.D. will still be 3/8″, identifying this one as a 3/8″ hose. It is often the higher priced hose that has a larger O.D. due to more mass in the wall thickness or integrating reinforcement into the hose wall for greater burst strength. Is it Air Hose or Air Tube? Be a bit careful when speaking with folks about air line hose. First, make sure they are talking about hose and not tubing. Take the time to clarify where the dimension they give you come from. A technician may provide a hose dimension such as 5/8″ or 3/4″, but they may be talking about the hose O.D. If you size the necessary fittings based on that information and don’t cross check, and you’ll be making another trip to the hardware store or the tool crib or the industrial distributor for correctly sized fittings. If it is air hose you are getting fittings for, you need to know the air hose I.D. to get fittings that are sized correctly for that hose. When you buy a low cost DIY type compressor, it will often come bundled with a low cost, lower quality PVC air hose. In the photo above, the hose separated from the connector within moments of me adding air to the line. Not a good quality product, at all. Further, PVC hose gets hard when the weather cools making it quite difficult to orient or coil when it’s cooler out in the workshop. It were me, even though it’s higher cost, I’d go with a decent quality rubber hose, similar to the one in the photo. A rubber hose is quite flexible in all but extreme cold weather, and is abrasion resistant. Air hoses often get trod on or have things like fork trucks running over them. Do yourself a favor. Buy a better quality hose if you want it to stand up to this abuse. Unless you are buying a bulk hose off a reel, typically your air hose will come complete with male NPT fittings on both ends of the hose. To use the hose, you will add a connector to the thread on one end, and a coupler to the thread on the other. 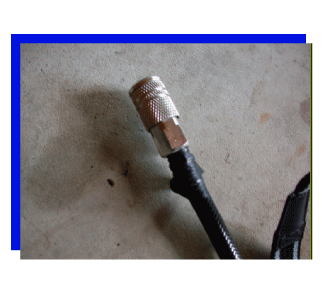 This creates an “air extension cord” which can be used to bring air to an air tool from the compressor discharge coupler. 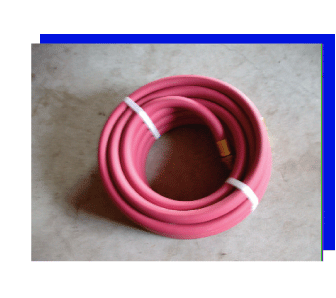 If you have two or more air hoses with couplers and connectors installed on them, you can connect one hose to the other, extending your air hose length almost indefinitely. It is always better to have a longer air hose to the point of use, than it is to use a too long extension cord for the air compressor. Air pressure drops as it moves through a hose. The longer the hose, the greater the pressure drop. That may have issues with the air tool running properly, yet, insufficient air reaching the air tool through a long hose cannot it. Pressure drop is a concern for your air driven equipment. It might be worth your time to have a review of how pressure drop affects your air tool use. Power drop through a too long or too light electrical extension cord can harm an electric motor. Better to ramp up the pressure and enlarge the air hose diameter and length to run the air tool effectively than to run a too long extension cord to the portable compressor and possibly burn out the compressor motor. Barbed style hose fittings will usually have a barbed profile on one side and a “quick connect” – a coupler or connector- on the other side. The barb will be a specific fractional size, and that is the size that will correspond to the I.D. of the hose. 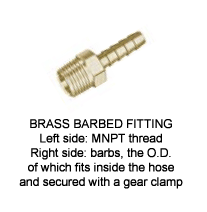 A specific barbed fitting will only fit a certain size of hose I.D. You would purchase a 3/8″ barb to fit inside the I.D. of a 3/8″ hose, for example. First you slide a gear clamp over the hose, then insert the fitting barb into the hose I.D. Some folks use a little soap to make this easier. If I find that the barb is tight, generally I just use some good ‘ol spit! Once the barb is inside the hose, slide the gear clamp back up the hose until it’s well over the barb inserted inside the hose. Tighten securely. On the other side of the barbed fitting could be another barb, it might be a coupler, it might be a connector, it could be a male or female thread. You acquire the barbed fitting that suits the air hose installation requirements. A reminder that though they both are used to transport compressed air, air hose is not the same as nor is measured the same way as compressed air tubing. We’d love to try and help as would many visitors. Please ask your question about air hose below and upload a photo or three if it will help.